← Message From Paul Sauerwine. 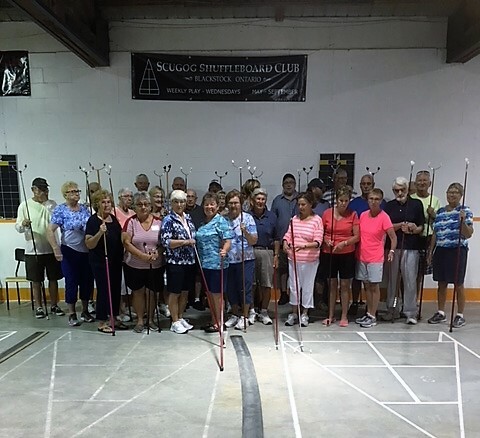 Club President Ann Davies Speaks: On Sept 12th, 2018 Scugog Shuffle Club closed for another successful season. Before storing the equipment away we enjoyed a few games of Hoss Collar, then the appetite was looking forward to a wonderful pot luck with a great variety. Ann Davies chaired the general meeting, thanking everyone for a great season. 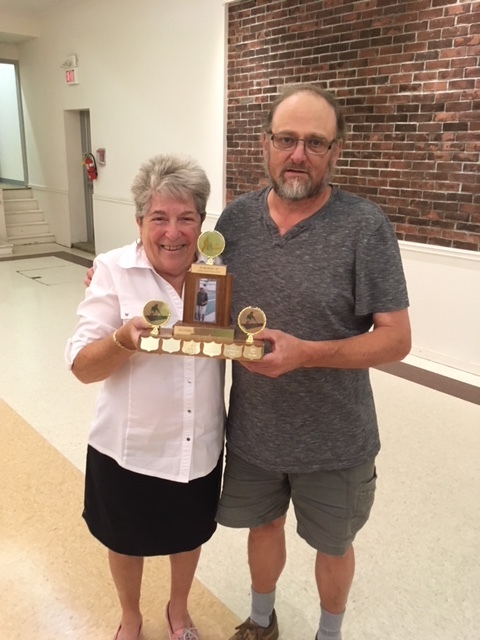 The trophy in honour of Gearld Balson ** (Ann’s Father) for most improved player was earned by Rick Wall this year. Pic of Ann presenting the trophy to Rick, above left. Donations from local merchants help keep this club alive!! They are greatly appreciated!! Will be looking forward to next May when the fun starts all over again.